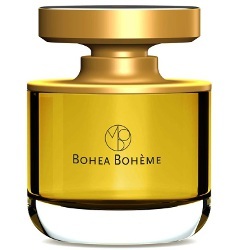 Niche line Mona di Orio will launch Bohea Bohème, a new fragrance inspired by Wuyi tea. Created by the talented Fredrik Dalman, Bohea Bohème captures the smoldering delicacy of the distinctive oolong cultivated in the Wuyi Mountains of China. The precious Bohea Tea, fumed with pinewood, is prized for its complex aroma and rich character. The notes feature bergamot, cardamom, iris, blue chamomile, poplar, fir balsam, boxwood, geranium, black tea, smoked juniper, oak moss, sandalwood, beeswax, bay laurel, benzoin and vanilla. Mona di Orio Bohea Bohème will be available in 75 ml Eau de Parfum. Update: a description from Mona di Orio ... "Bright and spicy accords of Bergamot and Sichuan Pepper arrive with the powdery elegance of Florentine Iris and the fruity florals of Osmanthus Absolute, as dry Hay and subtle green notes of Geranium surface. The warmth of the scent deepens and lingers as the sophisticated tea is steeped in nutty Amber, honeyed Poplar buds and an infusion of Balsams, Oakwood, and Gaiac." This sounds really good. I’m noticing a trend with Oolong/tea scents. Perhaps the new Oud? Not entirely over Oud, though! I’m interested in seeing how this brand evolves without the talented Mona. I hope they keep her spirit alive moving forward. It would make me perfectly happy if tea replaced oud as the big thing! I always do look forward to a new Mona di Orio and this sounds very interesting to me. I also now want to explore Wuyi tea! Have you had lapsang souchong? That’s a Wuyi tea, traditionally. But I think most of it is now grown elsewhere.